Q: Cyril, we had Daniel Ricciardo in here yesterday explaining his decision to join Renault. When did you start talks with Daniel and just how did that deal come about from a Renault point of view. Cyril ABITEBOUL: Obviously, we have known Daniel since a while for the collaboration we naturally have on the engine side with Red Bull since 12 years. We’ve had random discussions – jokes – with Daniel since a while. It would be hard to put an exact date on the first joke about this type of switch. But I’d say that’s it’s a while since we’ve expressed our interest in him, the fact that we liked him, his style, his skills, his talent, his leadership and the fact that there could be an opportunity for him at Renault. We’ve always been clear with what we are, what we are not yet, that we are still in the making. That if he was interested in a turnkey organisation, in a turnkey team with a turnkey car that would not be with us – but if he was interested in a project in construction where he could play a role, we would be interested. So, you know, that’s where we left it and we accepted also since day one it would take him a bit of time to digest and to consider because it was an important decision, you know such a switch is complex. It’s complex in life and in the career of a driver, which is short – but it’s also complex in the life of a team, both for all organisations involved. So, we accepted that. We accepted he would be sort-of making and controlling the timing and obviously we had to look at alternative options in parallel in case it would not happen. And yeah, I think he sort of digested the proposal and eventually made his decision. Q: It seemed to come quite late. Daniel said it was over a 48-hour period that he finally made his call. Did it come as a surprise to you as well when he finally gave you the news? CA: Yeah, it came both as a surprise but also as a relief because it’s positive news. It’s great news for Renault, for the team – but it’s also news that carrying not just lots of… not just emotions but also responsibility and some obligation to deliver. To deliver cars that are in-line with his expectations, with his talent. We were already obliged to our shareholders, to our sponsors, to our fans, towards the legacy of Renault. Now we are also obliged towards him, and we want this charismatic driver finds what he’s come to find and to look for with our organisation. So, we just have a bit more pressure – but it’s healthy pressure. Q: Christian, it’s basically the same question to you. When Daniel turned around and said he was leaving Red Bull, he said that that came over a short period, that he made the final decision. Did it catch you out? Christian HORNER: I suppose the whole process with Daniel has dragged on this year. Y’know, we started talking really in February, initially aiming to have something done by Australia and then obviously, that got postponed until after Monaco, and then Monaco got postponed. The whole process has been fairly drawn out. Obviously in recent weeks, Dietrich Mateschitz was involved in the discussions with him in the discussions from Barcelona, in Austria and all indications were that he was going to stay. Certainly, that was the intent from the team’s point of view. Obviously, Daniel, when he called on the Thursday, when he landed in the US, having had everything in front of him that he wanted and had required, financially, technically, duration etcetera, etcetera, there was something in him that he still felt he wanted a change. Certainly, that’s how he’s explained it to us and that he felt the timing was right to do something different. So, of course it was a surprise. We’d expected if he were to leave it would be a for a Mercedes or a Ferrari – but that’s obviously his decision and we fully respect that. We’ve had ten great years. Red Bull invested in him as a junior in Formula Renault. He then went on to win the [British] Formula 3 Championship. I remember going watch him at Silverstone in Formula 3 and seeing even at that stage his talent was very clear. He then obviously graduated through the Renault World Series into Formula One with HRT and from there into Toro Rosso and then from there was selected to partner Sebastian Vettel when Mark Webber retired. We’ve seen him grow during that time, evolve as a personality and as a driver. He’s been a pleasure to have in the team at Red Bull Racing the last five years. He’s driven some great races. He’s a big character. We’ve given him a platform to express that and we wish him well for the next journey in his career. Q: Gil, welcome to the press conference. Fernando was sitting next to Daniel yesterday and spoke a lot about his decision to move on, so we’re going to look to the future. You ran Lando Norris in your car this morning. It’s unusual for McLaren to run a different driver in FP1, so why that decision? Gil DE FERRAN: We’ve I think been investing in Lando for a fair few years now. We’re trying to give him as much exposure as possible. This was an opportunity for him to drive the car at a grand prix weekend, which is a different situation, more people on the track and a lot of track evolution and also a completely different level of downforce – so I think we keep walking the development road. Q: Looking to the future from a personal point of view, you’ve now been in the role for couple of months. What are your priorities at McLaren? GdF: Look, to your point, I’ve been here two or three months. It feels like a lifetime already! It’s been many long hours and I took the first phase of this appointment to really assess what goes on in the team and try to get to know the people better and understand what everybody else does in the team. And one of the things that is clear to me is that there’s a lot of talent within the team, up and down the organisation, so I guess my main priority is really to unlock that talent and hopefully turn that into better results. Q: (Christian Menath – Motorsport-Magazin.com) There’s been a lot of confusion about Fernando. He said that he had an offer from Red Bull Racing to race for you next season. Can you clarify that please? Christian HORNER: Just to be totally clear, there was no offer to Fernando Alonso for next year. Fernando is a fantastic driver, he’s a great talent in Formula One. He’s obviously chosen his path. We had an enquiry from Flavio Briatore, and from Liberty Media, but the position within Red Bull has always been very clear that we invest in youth and have a talent pool through the Red Bull Junior Programme. And as has been the case with Sebastian Vettel, Kvyat, Daniel Ricciardo, Max Verstappen, we’re always going to draw upon the talent pool that we have. We have offered Fernando a contract in the past, but that was back in 2007. Q: (Livio Oricchio – Globoesporte.com) Christian, what was the criteria to choose Gasly instead of Carlos Sainz Jr? And also, the same question I did yesterday to Max – if you see the numbers of both Toro Rosso drivers concerning the engine combustion internal MGU-K, MGU-H, they are over the limit for long and we still have nine races to go. Are you confident that Honda will solve all of these problems from the middle of the season to the next one, and also provide performance? CH: To deal with the fist part of your question, we selected Pierre Gasly based on what we see performance-wise the job he’s doing within Toro Rosso. Obviously we’d selected Max Verstappen prior to that having had the choice of either Carlos or Max at the time. To allow Carlos’ career to continue to develop we effectively leased him out to Renault to continue that career development. We had the option to bring him back, but faced with the options that we had and looking at relative performances that we chose, Pierre Gasly was the right guy to fill the seat and graduate into Red Bull Racing. Therefore we released Carlos immediately to pursue other options in Formula One. He had an offer on the table from McLaren that we didn’t want to in any way impede, make sure that he was free to be able to take that up, and it’s great to see that he’s now in a good team like McLaren. Regarding Honda, obviously the changes that you talk about – some of which are tactical, not purely based on reliability, in a development phase – they are pushing hard; we have confidence in what we see, in the investment that we see going into the programme, in the quality of personnel that are involved in the programme. Things are very much moving in the right direction; only time will tell, but I think that you’ll see inevitably more changes again this year, but it’s all part of a development process for 2019 and beyond. Q: (Dieter Rencken – Racing Lines, Racefans.net) Cyril, after Hungary with the Force India situation you expressed concern that its salvation could turn it into a Mercedes B-team or satellite team type situation, yet I believe that you signed your approval for the team to get its money, et cetera. So what changed your mind? Have you had assurances that this won’t happen, or what was the situation? CA: No, to be extremely clear we did not change our mind in the sense that we never wanted to cause any more difficulty for Force India. We are already at ten teams, which I think is the minimum for a sustainable Formula One. If you look at also, by the way, opportunities for young drivers obviously more teams would be better than less teams – or at least more cars – so clearly we would not want to have caused anything bad for Force India. Having said that, it is true that we have seeked reassurance from the commercial rights holder that in future it will not be a requirement to be part of a group of teams in order to be able to fight for championships or to fight for wins. That’s definitely our ambition, to be in that position, but we don’t have right now the capacity or the strategy to form any particular alliance such that we would have a junior team or a partner team. We have a partnership with the gentleman on my left on the engine side, which could be expanded with more technology, but that’s not really something that we want should be imposed on us as a model in order to be successful. So that’s the sort of clarity that we are seeking from the commercial rights holder, that could not be obviously obtained through some new regulations in the interim of time necessary for Force India way forward and survival, but particularly in the context of the work on the budget cap and the restriction on resources, that debate, that discussion, is going to become even more important. We’ve had discussions, I believe that we share the same vision as Ross Brawn, as Chase Carey, for the future of the sport, we don’t have any guarantee, but we understand that we see the world in the same way. Q: (Alan Baldwin – Reuters) Christian, you said that Liberty approached you after Daniel’s decision was made known. Are you suggesting that Liberty were somehow trying to place Fernando with you, or were taking an active role in trying to change his mind to stay in the sport? CH: There was just an enquiry as to whether we would consider Fernando. Which you can understand from a promoter’s point of view: Fernando Alonso is a great asset to Formula One; if he could be in a competitive car I’m sure they would prefer him staying than pursuing his triple crown. I wouldn’t expect them to do anything different. Q: (Scott Mitchell – Autosport) Question for Christian and Gil after Cyril’s comments about the Force India situation and the prospect of teams buddying up. Could I just get your comments on the prospect of the likes of Mercedes and Ferrari having that potential increased political power within F1? GdF: Look, I think that for us at McLaren the highest priority is to have Formula One that is entertaining, that is healthy, that is competitive, and sustainable -- where all the competitors are on a level playing field. I think throughout this whole negotiation that has been our main priority. Beyond that I’m probably not the right guy to comment. You should pass that question to Zak, I guess. CH: I think there’s obvious economic benefits, particularly for the smaller teams. We have Toro Rosso under the same ownership as Red Bull Racing, there are obvious economies of scale, but one has to be careful. Certainly something that we’ve never pursued is utilising wind tunnel time, other technical tools, to the benefit of one team. I think if there can be financial gain through the exchange of technology, that’s absolutely fine and something that should be looked at and included moving forward. But what we don’t want is that potentially Ferrari have two customer teams, that their capacity is effectively funding research and development of the lead team. That’s something I’m sure will get tidied up as we move forwards with the regulations, and particularly I think the golden opportunity to deal with that is the new Concorde Agreement or whatever it chooses to be called after 2020. Q: (Walter Koster – Saabrücker Zeitung) Mr Horner, you said in a German magazine some weeks ago that ‘drivers must be more important. Engines are too significant, they represent 70 percent of performance. That means that 30 percent remains for the chassis, tyres, and pilot. Do you have the impression that constructors and engineers moved the pilots into the background and that Formula One is particularly a championship of constructors and engineers? CH: I think Formula One today is a little out of balance. My personal view is that the engine within these current regulations plays too prominent a role. I think Formula One needs to be a combination of three factors in equal measure -- driver, team/chassis, and engine. If you have two of three of those elements that you can still be in a competitive position, and I think that at the moment we’re a little bit out of kilter because the engine is such a dominating factor that you can’t compensate if you have two of the other elements. Hopefully, within regulations that are being under discussion and appraisal for 2021, there is the perfect opportunity to try and redress some of that balance, At the end of the day, Formula One -- of course it’s a team sport, but the most prolific thing is the drivers, and we want to see the best drivers competing against each other more frequently. Q: (Dieter Rencken – Racing Lines, Racefans.net) Christian and Cyril, picking up on that particular point, and I think it’s timely because it was my plan to ask about the engines. Since you were last there, it seems as though the plans to introduce some form of different technology for engines from 2021, that there’s been a bit of a U-turn, and in fact in this week’s race programme Ross Brawn is saying that possibly the timing of 2021 should be looked at in any event, and that we may in fact keep the current units beyond that. How do you two feel about that, you as a customer and Cyril, you as one of the engine companies? CA: No, I would agree that I think what Formula One is trying to do for 2021 is extremely ambitious. It may be required, but it’s extremely ambitious, and what I mean by that is basically it will be the first time in F1 history I believe that we would at the same time change chassis regulations, engine regulations, Concorde Agreement, governance structure, new budget cap. That’s a lot. That’s a lot. There might be the risk of trying to embrace too much and not produce and deliver anything. Our view would be to try and be a bit more pragmatic and focus on what is the main emergency for Formula One, and I’m thinking really of the show, of the disparity between the teams, the disparity in the revenue. We think that this is really the main priority. I think some clarity on budget cap or not, because the costs are certainly too high. We don’t think that the engine regulations are at that level of priority. Am I satisfied with the engine situation? No. The answer is no, and we need to improve that, but that’s mainly by working and by working harder. I think that we’ve done investment and organisation change, and there is more to come so that we can overcome our deficit, but that’s our problem – that’s a Renault problem; it shouldn’t be a problem for the sport. That’s why I believe that we should reduce maybe the weight of that topic, of that issue, within all the list of priorities of Formula One. Stability should be, by definition and by default, the prevailing scenario in this circumstance. Q: Christian, your thoughts on those changes? CH: I think I understood what Cyril said! There are broad similarities. I think at the moment our situation is different to where it was two or three months ago. Stability is important. There's no new manufacturers coming in, these regulations are impossible for a new manufacturer, should they come in. I think that rather than making a half-hearted change and getting it half right, I think it’s better to take a little bit more time to really consider what is the right engine for Formula One moving forward. If that needs a bit more time, or a couple more years to achieve that, then that’s the sensible approach. Q: How long do you think it would take to plan that out? CH: I think at the moment now I can’t see anything changing before the 2023 season, to be honest with you. Q: (Luke Smith – Crash.net) Gil, are you able to give any updates on McLaren’s Indycar plans for next season. Zak previously said that a decision would need to be made over the summer and we’re getting towards the end of the summer and obviously that factors in with Fernando’s future as well? GdF: As you know, IndyCar is still under serious consideration, but we have not made any decisions of yet and I think when we have, we will let you know. Q: (Arjan Schouten – AD Sport) – A question for Cyril and Christian. We talked a lot about the future and next season, but the fact is this season is not finished yet. You already signed the divorce papers, but there are nine races to go. I don’t think that’s a very simple position to perform. How do you two look at the last races of this season. CA: With Red Bull? Frankly, things don’t change. We’ve had 11 years and a half of collaboration and we are not going to run that down for the last six months. I think Red Bull is still in the position to have good results, to secure some podiums, maybe some wins – they have done that already this season, so why not more. We need to have a discussion this weekend regarding the introduction of a new-spec engine, an upgraded spec of engine, which could come as soon as Monza, but we need to have that conversation based on their assessment of reliability risk versus extra performance. That’s the type of discussion we are prepared to have, to me in an air of the great of collaboration that we’ve had, so absolutely no change of philosophy or position on our side. Q: And Christian, your thoughts on that relationship and also the fact that Daniel is leaving? Is it a tricky situation for you between now and the end of the year? CH: It’s very much business as normal. We’ve got nine races to go. We go for it every weekend, we try to get the best results we can between now and the end of the year and that obviously includes with Daniel. I sat down with him earlier in the week, after he came back from his holiday and said ‘look, we’re not going to talk to you about what’s going on in 2019, but our objective is to do the best we can between now and the end of the year. The same rules apply as for the past four-and-a-half years. You’ll get equal opportunity and we just want them to give their very best until the end of the year, which I’ve got absolutely no doubt that he will do, but obviously things like simulator time and so on will now become much more restricted. Q: (Oliver Brown – The Telegraph) Max said yesterday, when asked about Daniel’s move, quite pointedly, that it’s a change of scenery, but he doesn’t think it’s the best scenery. You were obviuously, during the heat of battle in Hungary, very critical, saying Renault were supplying you with a sub-standard engine. Given the loss of Daniel is very significant, is there any added frustration in losing him to an organisation of which you have been very publicly critical? CH: I think the decision is Daniel’s choice, and as long as he’s comfortable looking at himself in the mirror with the choices that he’s made, you have to respect that. He is a free spirit. It’s the first time in his Formula 1 career that he has been out of contract. He doesn't have a management group around him or anything like that; He comes to his own decisions, and this is a decision he’s come to on his own, and you have to respect that at the end of the day. I’m grateful for what he has done for us and for the team. He’s driven some phenomenal races. There have been some iconic moments where he’s been making people drink out of shoes or whatever else on the podium. The decision to make that change, that life change, is purely his decision, and he has his own reasoning behind that. All he can explain is that he feels he needs a change. It wasn’t, as I say, due to any fiscal reason, or contractual reason, or feeling the team was treating him any differently to the other driver, so this is purely his decision, that he feels it is time to try something different. Q: (Andrew Benson – BBC) On the subject of the sport: Eau Rouge is flat, has been for a while now, Blanchimont’s flat, and this morning two of the cars, one of them being yours Christian, appeared to be flat through Pouhon as well. These are iconic corners that aren’t corners anymore. Is the grip power ratio wrong in Formula 1? GDF: My personal belief is that the faster the car, typically the more difficult it is to drive, because you have to perform all the same things in a shorter period of time. That makes it more difficult for you to accomplish that in a very precise way. Having said that, to your point, there are a few corners that were very difficult corners. When I was here, God knows, 20 years ago, Eau Rouge was a very difficult corner and it doesn’t appear to be that way any more, so I think the balance between tyre grip, car weight, downforce, and power are really the big knobs you can turn to affect that and maybe they should be looked. CA: No, I fully agree that power to weight and power to drag are probably not what we need in order to have spectacular races. Not necessarily races, but to have aspirational drivers, because we need to be able to see the drivers fighting against their car, fighting as they enter into every single corner, and we don’t see much o that any more. I think this is distorting our image of the drivers, who are still doing a remarkable job, but we don’t get the same sensation, emotion, as spectators. So I think that should be one of the priorities of future chassis and engine regulation, because you could increase the power also. Q: Anything to add, Christian? And were you flat at Pouhon? CH: If you look at our car and the amount of downforce wer are running on the car, some of those corners are pretty exciting for the driver. Some of the corners here, if you look at Eau Rouge, with kerbs being moved around a bit, run-offs being included nowm there is no penalty, ultimately, for getting it wrong now, You’ve got safety versus performance discussions there. Some of the corners are perhaps made a little bit too easy as well and it’s when you get a variable condition here that then things become really exciting. You get a little bit of rain, and suddenly Eau Rouge becomes a big corner, Blanchimont becomes a big corner. So it’s that balance. Q: (Louis Dekker – NOS) Christian, can you give an indication about the competitiveness Red Bull have on this circuit, knowing you problems with speed etc? CH: We understand that Mercedes and Ferrari are introducing upgrades this weekend on the power unit, and I think this weekend and next weekend are going to be difficult races for us. But you know there inclement weather around at this circuit, so anything can happen but I think you have to say that Ferrari and Mercedes very much have the upper hand at these two venues. Hopefully when we get to the likes of Singapore and Mexico we’ll be able to give them a harder time. Q: (Dieter Rencken - Racing Lines, Racefans.net) Cyril, Christian has just said and it has also been reported that they were willing to accede to all Daniel’s demand. That would have included some sort of substantial fiscal demands. Obviously, to get him you must have matched it or come very close, whichever way. It’s no secret that Renault doesn’t exactly have the biggest budget in the paddock, so from a commercial perspective, have you had an increase in budget to cover it next year, do you get more money from Renault, are you going to cut back on some of your expenditures or how do you commercially afford him? CA: Two comments: First, in my opinion, Renault can afford pretty much anything. Renault is the largest car maker involved in Formula 1 – full stop. So we can afford anything as long as it makes sense. Then it’s just a question of value for money and whether it makes sense to spend that given where we are in the development of our team. Second, I don’t think we were the highest bidder in obtaining Daniel, without going into details. He bought into the project not necessarily because of the money. I don’t think it would be great to put this sort of light on Daniel. And lastly, it would not make any sense to bring a driver by having to make some concession on our capacity to finance the development of the engine or the chassis. So, in shorthand, obviously it means an increase of our budget. Q: Otmar, not much of a summer break for you, I’m sure it was very busy. But now you are the Team Principal of Racing Point Force India. Can you just talk us through the past few weeks from your perspective? Otmar SZAFNAUER: It was a busy few weeks for myself and mainly for the administrator who was trying to find a solution for our administration. I was busy basically informing all of our team members who were on holiday of the goings on and trying to communicate what was happening. It’s not an everyday thing, administration, and a lot of people didn’t understand the process and when you don’t have a good understanding of the process it creates anxiety, so I was just trying to keep everyone together and informed. But well worth it in the end. Q: And then more specifically, this past week and especially the last 48 hours since arriving at Spa, what’s been going on behind the scenes? OS: I think, from what I understand, it started of as a share sale that then transferred into an asset sale, for reasons I don’t quite understand. But once that happened we needed a new entry into Formula 1 and to gain a new entry in a short period of time takes a lot of work, so the last 48 hours was working towards Racing Point Formula 1 Team gain its new entry, and that was a lot of work to do that. But fortunately with the support of the FIA, FOM, our fellow competitors and colleagues within our community, we got it done. I’ve got to thank the teams as well for supporting us. Q: Speaking of the other teams, we’ll move on to Claire. Force India’s future has been closely intertwined with yours based on Lawrence Stroll’s involvement. Can you let us know where this leaves Williams going forward? Claire WILLIAMS: First of all, I think this is obviously a great story for Formula 1. Prior to the shutdown we were all slightly concerned as to Force India’s fate, and I think Lawrence stepping in and securing the team’s future is a great thing, not just for our sport but obviously for the employees, so at Williams we are delighted. I think probably the biggest knock-on effect for us will be the lack of Lawrence’s presence in our motorhome. I know that he has spent a bit of time in the Force India motorhome this weekend already. But for us at the moment, it’s business as usual. Lance still has a contract to drive for us until the end of the season, he’s racing for us here in Spa and Lawrence is still in our motorhome. Q: You mention Lance. He was sitting in that seat in yesterday’s press conference and said that he’ll wait to see what his dad wants him to do in the future and hopes he’ll take him to Force India. Can you just clarify: will Lance race the rest of the season for you? Is that what you expect? CW: There are a lot of twists and turns on Formula 1 aren’t there? I think we’ve seen that over the past few weeks alone. I think it might be slightly odd if Lawrence owns one team and his son is another, but hey, this is Formula 1! At the moment, as I said, Lance is contracted to drive for us, he’s driving here this weekend and as soon as we have more information, when we know, then we will share that. Q: Thank you. Franz, a confirmed move in the driver market is that Pierre Gasly will leave yourselves next season and move up to Red Bull. Just what are Red Bull getting in terms of a driver in Pierre? Franz TOST: They will get a high-skilled, very fast, experienced driver, because Gasly is a good example of how to build up a driver. He was very successful in all the lower categories, where he won races, where he won championships, and when he came to Toro Rosso at the beginning of the season, he was already quite experienced. He is fast, he has a good technical understand, he has a good understanding for the tyre management and therefore I am convinced that he will do a very good at Red Bull Racing. Q: With Pierre moving up that means there is at least one space available at Toro Rosso next season, but there is not a huge amount of drivers ready at the moment within the Red Bull Junior Programme, so what do you do for 2019? FT: We will see. Red Bull is discussing different names and I am convinced in the close future they will come up with a name. Q: (Scott Mitchell – Autosport) Otmar, the situation around the team means that there are quite a few consequences for you guys. So could you just explain what the resolution is on things like championship prize money and where you stand with engine allocations and that sort of thing, and what it means for the team as well? OS: Well, the biggest consequence is the fact that we start from zero points, so we forego the 49 points, because those belong to Sahara Force India, which is not an entrant anymore. We are a new entrant and we start from zero. We’ll do the best we can to score as many points as we can in the remaining race and we’ll see where we end up at the end of the season, and that will determine some of the prize fund for the following year. As far as engine allocation goes, we had confirmation today from Charlie that we will continue with the engine allocation and gearbox allocation as if we never ceased racing. I think in his eyes he thought that was the most fair thing to do vis-à-vis the other teams, so that’s how we’re going to go forward. Can we just clarify, Otmar, that if you are foregoing the championship points that you had already earned this season, you are having to forego the prize money earned in previous years by Force India? OS: No. The remaining nine teams have signed, so to speak, a document that enables us to keep the money that Sahara Force India had earned in years past. Q: (Luke Smith – Crash.net) Otmar, we know that Force India was considering a name change both for this season and looking ahead to 2019 as well. As a new entrant, now would have seemed like a perfect time to get rid of the Force India name. What were the reasons behind keeping that in the new team name? OS: Isn’t that ironic: we wanted to change it, we didn’t, then we could have changed it and we didn’t? The reason is we started the year with Force India as our chassis name. Formula One, the FIA, they don’t like chassis name changes and I understand why, because it confuses the fans. And we thought it was prudent to keep Force India for the fans. The cars’ are still pink, we still have the same sponsors, we still have the same drivers, we have the same motorhome, we have the same employees. You look at us, we’re exactly the same. I think it would have been confusing to remove Force India. Racing Point was added in front of Force India instead of Sahara – we were Sahara Force India before – that was just so we can distinguish between the old and the new and Racing Point just happens to be the name of the company in the United Kingdom that owns the assets to that’s the only reason for Racing Point being there, but the chassis name still remains Force India and I think from a fan point perspective that’s the right thing to do. Q: (Oliver Brown – The Telegraph) For both Otmar and Claire: a lot of people in F1 like to talk about this sport being a meritocracy and yet the conjecture which now links Lance with Force India arises purely from the fact that his father is part of the consortium that controls the team. This doesn’t have to be referencing Lance specifically as I know it’s sensitive but how much do you feel that F1 genuinely is governed by ability or is it still governed by who you know? CW: I’ve talked about this point a lot over the past 18 months. I think the crux of it for us is that as a team, as you would expect, we wouldn’t put a driver in our car for a variety of different reasons if we didn’t feel that they had the ability to race a Formula One car. These machines are not easy to drive, they’re dangerous, you want to make sure you’ve got somebody who’s competent enough to be in that race car and Lance has proved that. I also believe that over the time that he’s spent with us at Williams, that he’s demonstrated that he’s got talent and that he deserves to be in this sport. He had a season last year in his rookie year where he took the first row of the grid in Monza, I think it was. He took a podium, one of the only drivers to do so last year outside of the top three teams. So I don’t think that you can say that Lance is only in this sport because of his father. OS: I tend to agree with Claire. Lance, for sure, especially in the lower formulas, has proven to be a race winner, a winner of championships. We’ve been watching him too because he’s a competitor of ours and the one thing Claire didn’t add is that every time it rains it seems like his talent shines and that’s usually the sign of a driver that has great car control so we don’t know him intimately but for sure he deserves to be in this sport, not just because of his Dad. Q: (Dieter Rencken – Racing Lines, Racefans.net) Otmar, the situation of yourself is that you’ve gone from COO to CEO and also team principal. Could you also confirm that you were given a shareholding up to 25% of the revised company please? OS: Wow. Wouldn’t that be great? Haha. Yeah, I can confirm that that isn’t the case but I like your suggestion. I’m going to go… before the ink’s dry, I’d better go talk to Lawrence and the consortium. That’s a good idea, that’s a good idea! Q: (Julien Billiotte – Autohebdo) Otmar, will you keep the same driver line-up for the remainder of the season or could we see changes at Racing Point Force India from Monza onwards? OS: Yes, for the short term, it’s the same two. What happens thereafter it’s not impossible to change, that’s for sure, but a lot of agreements would have to happen so I don’t know, it’s hard for me to predict that in the future. FT: As I mentioned before there are different names which are being discussed but up to now no decision has been made so therefore we just wait and Red Bull will announce it. Q: (Luke Smith – Crash.net) Franz, are you able to give any updates on James Key’s status? McLaren said they had a plan to get him out of his contract early if possible. Do you see that happening any time soon? FT: I don’t care about the plans from McLaren. Fact is that he has a Toro Rosso contract. 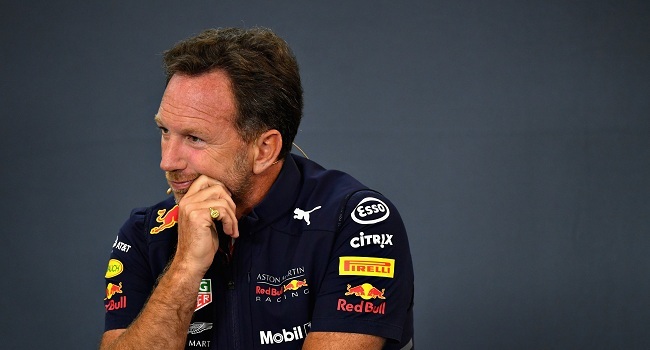 Q: (Dieter Rencken – Racing Lines, Racefans.net) Franz, with the main team, Red Bull Racing, taking on Honda engines next year, are there any plans for yourselves to have a far far closer technical operation in terms of listed parts etc or how do you see that evolving? FT: We will have a very close cooperation with Red Bull Technology next year because we will have the same rear part, which means the power unit, gearbox and the suspension, everything within the regulations, because we want to use this much. Yeah, the front suspension as well, the inner parts, not the outer parts, that’s all, but that’s a lot, because you know the complete rear part means also the hydraulics, the electronics, all this kind of stuff. Q: (Pierre van Vliet – F1i.com) Otmar, about the name thing, is it going to stay the same? The team name? The chassis name for 2019? OS: Yeah, we’ve got some time to decide that but I believe now that we are a new entrant with Force India as a chassis name. For us to change, we will have to get approval from the Formula One Commission, so we’ve got to come up with a name that will be lasting and appropriate and also be approved by the Formula One Commission so I don’t know what that is, this is brand new, but the good news is that we’ve got a few months to think about it before we have to enter next year or for next year.